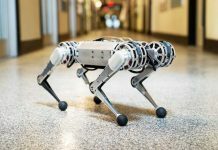 NEOFECT that enables and empowers people with hand paralysis to perform daily activities has developed a wearable, soft robotic hand called NeoMano. They named this gadget NeoMano which means “new hand” in a Latin/Spanish amalgamation. 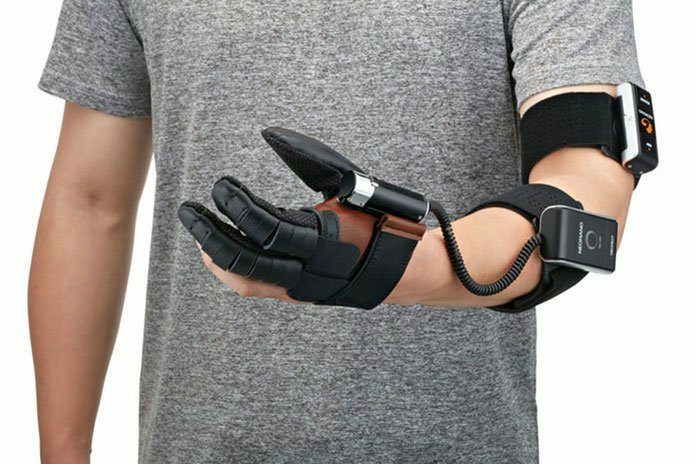 This wearable robot helps restore people’s hand function. It is to wear on three fingers. The NeoMano is a boon to people who have no strength in their hands though they can make a movement in their wrist and arm. This includes people who suffer from hand paralysis due to spinal cord injury (SCI), stroke, Lou Gehrig’s disease (ALS), multiple sclerosis, cerebral palsy and nerve injury. Its uses differs according to the diagnosis and individuals hand function. 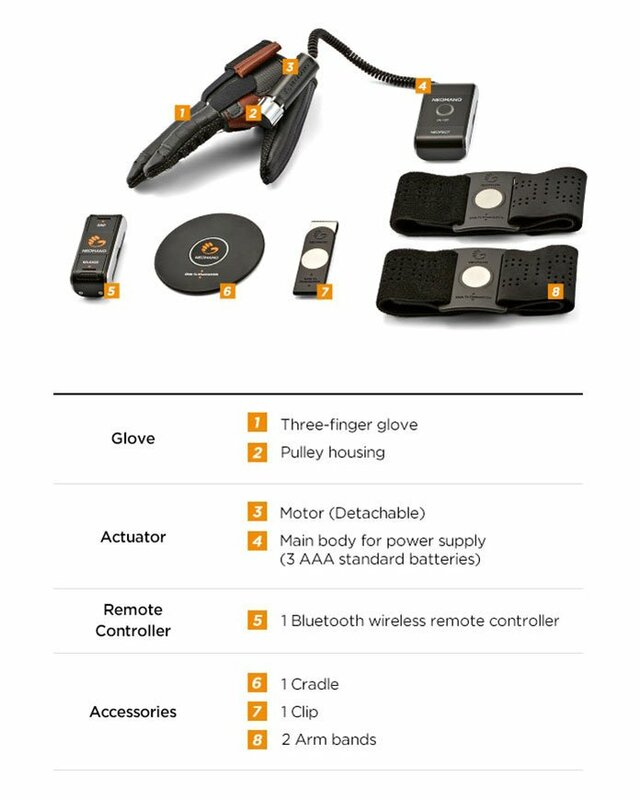 NeoMano has a complete kit which includes accessories like the glove, motor, remote controller, clip, and others as shown below. You can manipulate the position of thumb with the aluminum splint on the thumb. Likewise, you can adjust the index and middle finger to form a C-shaped grip for larger objects, and a pinch grip for smaller objects. 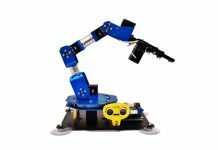 The motor allows the fingers to bend and provide various degrees of gripping strength, along with the passive release. The glove is equipped with an assistive strap, made of neoprene fabric, on the back of the index finger to adjust the degree of tension. This is an aid to people who suffer from finger stiffening to maintain a better hand position for functional use. The silicone coat on the palm and fingers help provide a firmer grip on objects and prevents slipping. The exposed fingers and palm were designed to provide tactile sensory input. 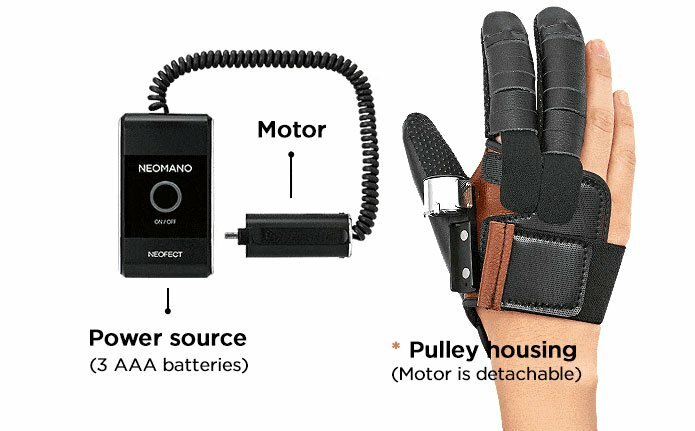 The Bluetooth wireless remote control enables the grip and release of the NeoMano, powered by 3 AAA batteries that hook into the glove via the motor. When activated, the Grip button flexes the fingers to enable a gripping gesture. The Release button loosens the wires, allowing the hand to return to its original neutral position. The wire is highly elastic, which helps maintain wire integrity despite repetitive winding and loosening. When the glove is not being utilized and powered by the motor. In this case, the motor can easily be detached by carefully pulling it away from the magnets on the glove. This allows people to easily transition from active to passive use of the glove. The power source has a button. 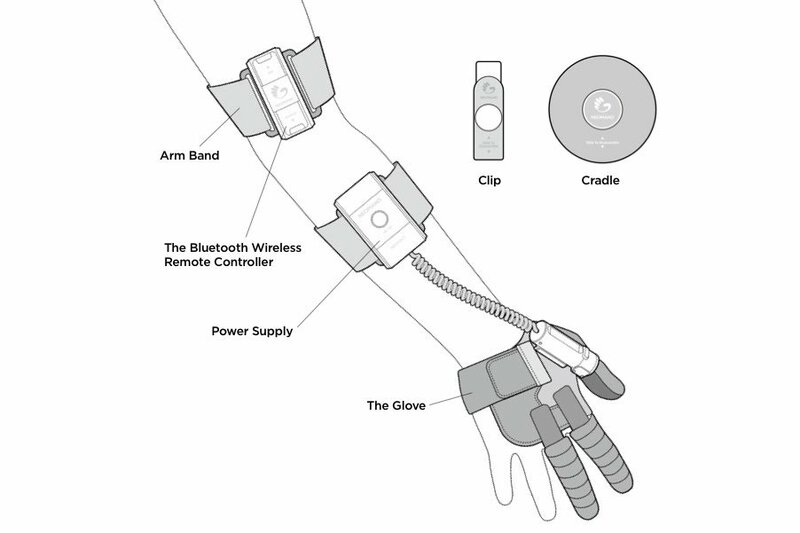 The button will pair the Bluetooth remote control to the motor for wireless control of the glove. Wireless Bluetooth remote control directs movement of the glove. 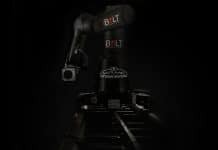 The Grip button will activate the wires within the glove to begin to wind and will create a tighter grip the longer its held down. It uses to perform daily tasks. 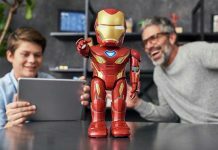 Daily tasks are arduous to perform for people who don’t have full functionality from their hand, which is why many rely on assistive devices or caregivers. NeoMano allows people to return to their daily-living activities and hobbies. It boosts confidence by providing more independence. The grasp pattern provides the independence required to perform tasks single-handedly, allowing people to move forward with their lives. It is made from flexible material that comfortably fits over the thumb, index, and middle finger. 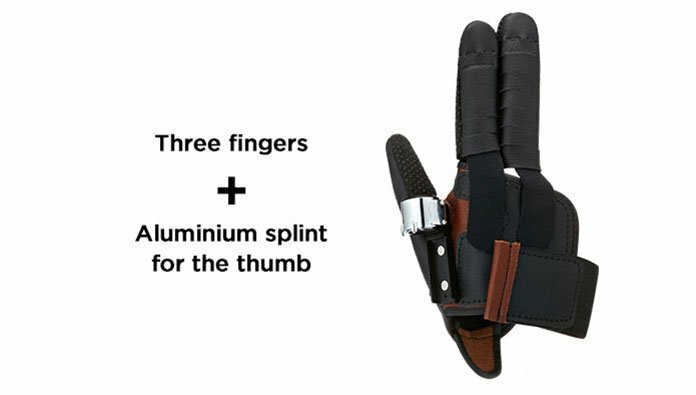 The partial glove design allows tactile sensory input to part of the palm and exposed fingers, and the leather allows for the flexibility essential for everyday tasks. Similarly, every accessory of this gadget is carefully curated to provide comfort to the user by all means. If the wrist functions properly, users can grab a water bottle to pour water into a cup and can hold it. Users can grab a pen to write texts or a signature. A user can hold a bottle and open the lid. Users can grab a brush to paint a picture. Users can read a book as they flip the pages. Similarly, there are many tasks can be done where gripping is involve and the disabled person cannot attempt.